French toast was created by medieval European cooks who needed to use every bit of food they could find to feed their families. They knew old, stale bread (French term "pain perdu" literally means lost bread) could be revived when moistened with milk and enriched with eggs. The traditional method of cookery was on a hot griddle prepped with a little fat (butter, oil). Quite like today. "French toast" recipes exist in many countries and cuisines.The beauty of this simple dish is that it can be as basic or fancy as the cook pleases. "French toast" is most often eaten for breakfast, although some variations are enjoyed for dessert. It has also been incorporated into popular other dishes, such as the Monte Cristo Sandwich. Did you know if you go to France it is unlikely you will find “French toast” on the menu? That's because in France the dish is called “pain perdu”. I could eat breakfast food morning, noon and night. Do you like eating breakfast food for lunch or dinner?... leave me comment. In a dish, whisk together, eggs and water. In large skillet, melt 2 tablespoons butter over medium high heat. Dip bread into egg mixture, making sure to coat both sides. Using a fork, remove bread from eggs mixture, making sure to let mixture drip off. Place bread in hot skillet. Cook 2 minutes per side, until lightly brown. Repeat procedure with remaining bread. Set aside and keep warm while you prepare topping. In skillet, melt butter over medium low heat. Once butter has melted, add light brown sugar, cinnamon, ground ginger and bananas. Stir gently. Heat through, about 5 to 7 minutes. Spoon over french toast. Serve immediately. Enjoy! Awesome looking French toast. Who wouldn't wanna wake up to that?! I love french toast! I usually make it with eggnog - especially during the holidays! Looks fabulous Christine. Bookmarking for hubs. I love breakfast foods. Morning, noon or night, they make me happy. French toast and bananas are just meant to be together. Yum! Who doesn't love French toast! This reminds me of a Banana's Foster French Toast that I made on my blog. Hi Lazaro, thank you so much! Hi Ann, never tried using eggnog when making french toast. Sounds good. 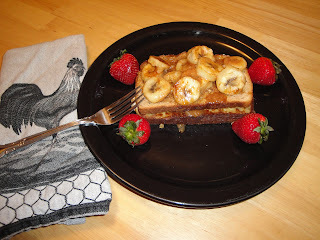 just stumble with another blog today and also about french toast but kind a different made with tomato but I think that is a great idea...your french toast looks delicious...I love the combination of banana and strawberry. I can't imagine French toast without a splash of vanilla, makes me think of my late Grandma. this sound good to serve in a lovely morning. I am still on a tropical kick and french toast with bananas sounds wonderful for breakfast. Lovely photo! Love this recipe! So delicious!!!! A good breakfast for dinner always is a quick and easy way to get something on the table - its also delicious. I typically run in the morning so I never have a big breakfast in the morning. I loved learning about the culinary history of one of my favorite breakfast dishes. I'll give the recipe a try. I love your blog-- and love that you wrap up each month with "your favorite recipes". Hi Emily, I normally just grab a cup of coffee in the morning and go. Normally we have a big breakfast on the weekends. Hi Sarah, chopped walnuts or chopped pecans would be good on this. Yum! Hi Alida, if you try this, let me what you think. Thanks. Hi Erin, welcome! I was visiting your site, and was going to leave a comment but I couldn't. I'm following. I just learned something new, thanks Christine!! I love eating breakfast any time of day! I eat breakfast for dinner all of the time! I love french toast, and this looks like a delicious version! One word....YUM! I like the history you always include too. A great recipe and a history lesson...what's better than that? Yummy! I love french toast topped with fruit! Great weekend breakfast! I can eat this anytime of the day esp. if the presentation is as good as yours! Love it, Christine! Am looking at this and thinking when was the last time I had a french toast .. LONG time. This looks lovely. Nice Christine, simple and my fav added in, the bananas. Yes, I used to eat breakfast food for supper at least 5 times a month regularly. I love the syrup you made witht he banana in it. I could eat breakfast food for any meal! Delicious...and I'm a food historian too! I can completely imagine how this well taste and I’m imagining very good things. Mmmmm, I love french toast! And especially with bananas! I like how you can eat this and not use super sugary syrup! Will you make breakfast for me? This looks good. French Toast is one of my favorite breakfast treats. Thanks for sharing your recipe. Awesome!... may I say it again?... awesome! French toast is perfect for breakfast, lunch or dinner. Great addition with the bananas. Oh so yummy! Looks really good :) Thanks for sharing! One of my favorite breakfast foods! I LOVE breakfast at any time of day. It's my absolute favorite meal! French toast = delicious. French toast + bananas = heaven! I love breakfast day and night! This sounds very much like one of my favorite plates at a breakfast place near us, I will have to give it a try! I always call French Toast Pain Perdu. I love thinking how I bring it back to life with a new dish. With bananas sounds delicious. I adore breakfast food anytime of day or night. I especially love French Toast. Thanks for your recipe.